1. Don't visit marine parks or aquariums that hold whales or dolphins. There is a chance that they may have been captured during a drive hunt. Drive hunters make money because aquariums pay them for the dolphins they capture, so it gives them an incentive to keep doing it. Embassy of Japan in Washington D.C. If your country is not listed here please write to the Prime Minister of Japan, see below. Thanks! 3. Copy the text below and send it to the Prime Minister of Japan, Mr Shinzo Abe, or send your own polite comment on the hunts. The dolphin drive hunts resumed on September 1st, and I am very worried by reports that more than 16,000 dolphins and porpoises may be killed this year off the coast of Japan. 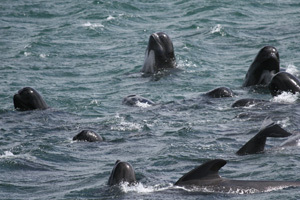 One method of hunting is the drive hunt, in which large groups of small whales and dolphins are rounded up using boats and driven towards the shore where they are trapped in a bay or cove using nets. They are then either killed with knives or taken away to a slaughterhouse. Also, Japanese people are being sold dolphin meat, which is full of dangerous mercury, often labeled as whale meat. Some of the trapped dolphins are kept alive and chosen by marine parks that pay lots of money for them to display in their tanks and pools; this money gives the hunters the incentive to keep the drive hunts going. Many of these dolphins die of stress during the process and/or face a shorter, sad life in captivity. I respectfully ask that the Japanese government cancels the permits that allow these hunts to continue.